Maya Plant Use: Food, medicine and products. 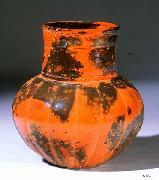 Squash and gourds were an important part of the ancient Maya diet. Although they lack most of the polychrome detail that other ceramics display, they are accurate depictions of a wide array of genera and species of plants that were an integral part of their daily lives. Due to accurate depictions in a wide variety of shapes, determinations can be made as to the foods they enjoyed. The pollen record can also be used to verify results. The plants depicted here may be that of Cucurbita maxima? Pumpkin pulp can also be used to heal wounds while the seeds can be used for kidney ailments and intestinal worms (Dobelis, 1990). 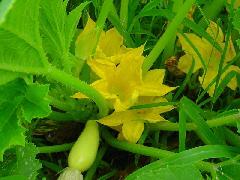 Botanical Significance: Squash is well known in Maya archaeology and ethnography. Squash was an important crop to the ancient Maya. Evidence of its use has been found in the pollen record and in the form of ancient ceramics. Squash was important crop to the ancient Maya, secondary only to maize and cacao. Ritual Significance: C. pepo and C. moschata species were in use in ancient times with evidence of this found in the pollen record as well as in ancient Maya art and iconography. Notes: Include? C. mixta and C. ficifolia instead? (see S. Coe, 1994 p. 39-40) C. lundelliana L.H. Bailey, C. melo L. or C. anguria L.?